There is no shortage of sellers offering their own Doctor Who Tardis, but this one is even better. Instead of just sitting out a little blue box to collect dust, this one is capable of moving around a little. Plus, the way it work will give you something to fidget with while you’re trying to think over some very complex issue at work. 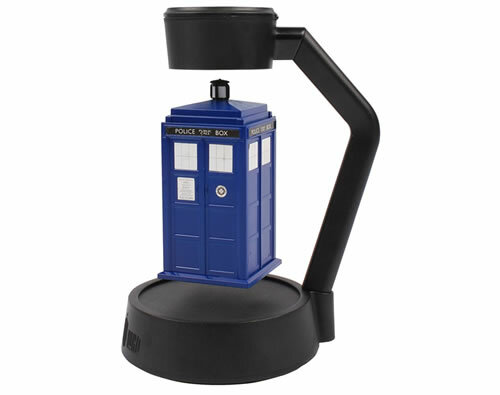 This Tardis levitates in mid-air by using some handy little magnets. Then when you’d like it to spin around all you have to do is give it a gentle push. You’ll get to see it spin around as if it were all on its own in some mysterious vortex. This runs on 6 AA batteries and for once I’m a little disappointed that this isn’t a USB gadget. Being best on your desk, you’d think it use the power already nearby. You can purchase this for $44.95 through the Neatoshop.